This post concentrates on an ultra-limited edition series of models with a total production run limited to 100 units. On behalf of several artists and owners, myself included, I will say that Deans are very good guitars. If you check our histories section, youâ€™ll see that the company was started in 1977 by one Dean Zelinsky, who wanted to make great guitars for rock musicians (something he achieved, if the legions of celebrated Dean fans including ZZ Top, Dimebag Darrell of Pantera and shredder Michael Angelo Batio are anything to go by). However, due to an error regarding serial number application, the guitars were labelled from 77 00101 onwards. Thatâ€™s why the historic reissues youâ€™re reading about were created – to show what the guitars built by Dean were like in 1977. The 99 guitars are based on the V, Z and ML body shapes (the only models made by Dean in 1977) with serial numbers from 1 to 100. Â All are signed by Zelinsky himself. They are all exact reproductions of what the Dean of 1977 was really like, right down to the oft-altered shape and size of the headstock. However, they were built from 2006-8 and nearly all (if not all) have been sold, and at Â£3660, they are pretty pricey. But assuming they havenâ€™t all been sold and you have the cash, you could get an exact replica of a classic rock instrument, with all the features retained on modern Deans- the high-quality set-neck construction, long-lasting sustain from the mahogany body, and Deanâ€™s renowned pickups. 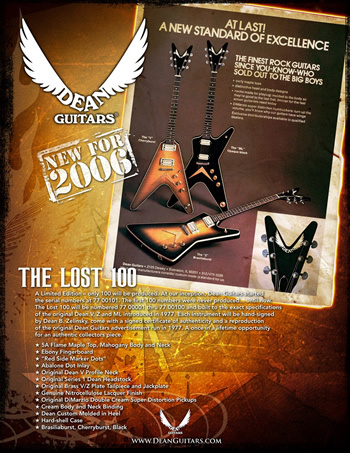 Even if you canâ€™t afford a Lost 100, there are whole ranges of less expensive Deans, like the 79 and Time Capsule Series.